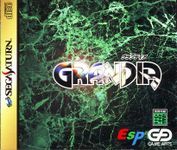 A role-playing game developped for the SEGA Saturn in 1997. The characters in the game are in 2D, whereas the environments are in real-time 3D, and thus allows for rotating. The player takes the role of Justin, budding adventurer who itches to folow in his father's footsteps and be a great adventurer that will discover whole new secrets about history and the past. Only the untainted souls of the adventurer may open the door to the unknown." Source: Wikipedia, "グランディア," available under the CC-BY-SA License.